NEWBERG, Ore. (CNS) — A common faith, thinking as a team, being flexible and arguing candidly but respectfully describe some of the keys to a strong marriage for Claude and Yvette Arrington, named Oregon’s longest married couple by Worldwide Marriage Encounter. 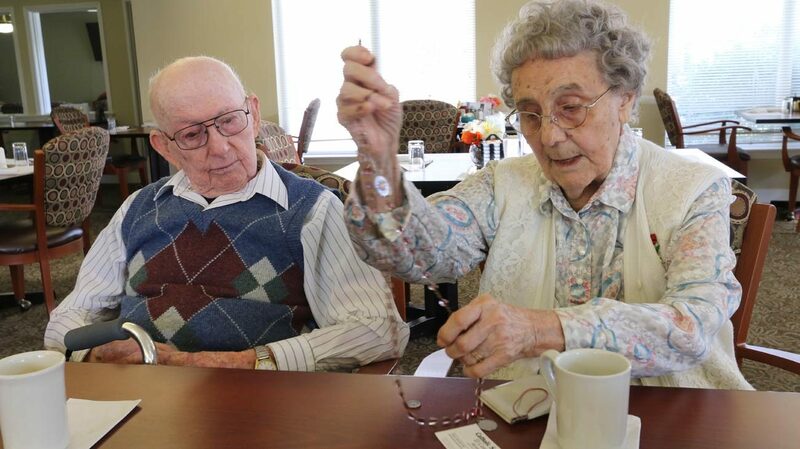 “We’ve had a super life,” said Claude, 95. “We’ve always had God at the top and we let him decide,” added Yvette, 93. The couple was married May 23, 1942, at St. Elizabeth Church in Van Nuys, California. Claude, who was raised Baptist, became Catholic before the wedding and says his faith provided a foundation for a good, long marriage. He was born in Los Angeles, and Yvette was born in a small town near Winnipeg, Manitoba. By 1940, they were both at Van Nuys High School. They met there and married soon after graduating when it became clear Claude should join the Navy. During his 20-month tour, the couple only corresponded with occasional letters. Yvette, home with a baby girl, did odd jobs while Claude sent home what money he could. The household got by but without much to spare. Claude’s ship headed to Hiroshima just after the atomic bomb was dropped. He and his shipmates were about to go ashore into the contaminated zone when orders came to leave the region. The vessel then picked up emaciated prisoners of war and survived a typhoon before returning to the United States. The couple would have four children — three girls and a boy. Today, they also have eight grandchildren, nine great-grandchildren and three great-great-grandchildren. They said they agreed on how to raise a family before they married. “We did a lot of talking to find out our likes and dislikes, religion and everything else,” Yvette told the Catholic Sentinel, newspaper of the Archdiocese of Portland. To help make ends meet for the growing family, Yvette opened a home child care and eventually worked for the local school district. Claude became a mail carrier, but cleaned schools in the evenings and a restaurant on weekends. He delivered the Los Angeles Times early in the morning, including to the home of Liberace, the piano star. On weekends, a relative would come watch the children while Claude and Yvette went on a date and in later years, they took longer trips. They have been in every state, plus Belgium and Canada and have been on a few cruises. Through it all, they have kept lines of communication open. The couple came to Oregon 11 years ago to be near their daughter, who drives them to St. Peter’s Church for Mass each weekend. Yvette belongs to the Catholic Daughters and has a deep devotion to Mary. “Our Lady has been very good to us,” she said. Across the country in Nebraska, two couples — one married for more than 70 years and the other, more than 60 years — can tell similar stories of faith and perseverance that have seen them through life’s challenges. William and Evelyn Schulte, members of St. Wenceslaus Parish in Dodge, Nebraska, relied on their faith during wartime separation, the death of a son, health issues and other challenges. The Schultes were married Feb. 12, 1946, at Sacred Heart Church in Olean, Nebraska. But before that, William was away for four years during World War II, including two years in the Pacific theater. Faith also was a source of strength for William who said he only missed Mass twice while he was in the service “and those were for legitimate reasons,” he said. Frequent letters also sustained the couple during the war, many of which Evelyn saved. Separation because military service also was a challenge for Richard and Barbara McMahon, members of St. Patrick Parish in Gretna, Nebraska, who have been married more than 60 years. As they planned their wedding, Richard’s assignment in the Air Force was going to prevent him from coming home for their wedding date, so Barbara’s sister, Jane, who was planning her own wedding, invited them to share a double wedding with her. The couples were married Aug. 18, 1956, at St. Joseph Church in York, Nebraska. The Schultes and McMahons shared similar stories of long, productive careers, hard work and child rearing, with faith always at the center. After the war, William Schulte had a 30-year career as a mail carrier while Evelyn was busy at home raising their four sons and one daughter. They now have nine grandchildren and 11 great-grandchildren. Over the years, William and Evelyn have often volunteered in their parish, William serving at weekday Masses, Evelyn bringing Communion to residents of the local nursing home. And she remains active in their parish, leading the rosary every other Saturday evening. Like most married couples, the Schultes experienced the joys and struggles of marriage and family life, including health challenges and the death of a son, regularly turning to the Lord in prayer, she said. The McMahons, who raised one daughter and five sons, also experienced the loss of a child and share a similar commitment to faith and prayer. Following four years in the Air Force, Richard McMahon worked 30 years for Union Pacific, and Barbara, once their children were raised, spent 27 years managing temporary employment agencies. They have 13 grandchildren and 12 great-grandchildren. “There are always problems in life and we’ve had a lot of things you don’t expect, but you just go with it and you pray a lot,” Evelyn added. Langlois is editor of the Catholic Sentinel, newspaper of the Archdiocese of Portland. Contributing to this story was Mike May, senior write at the Catholic Voice, newspaper of the Archdiocese of Omaha, Nebraska.